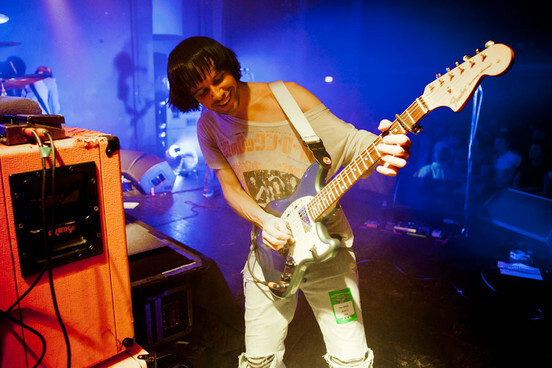 Ryan Jarman has said that his new band Exclamation Pony are a "lot more heart-on-sleeve" than The Cribs. The project is a collaboration between Jarman and former Here We Go Magic member Jen Turner, with the pair releasing their new track 'Rumours' earlier this month. With The Cribs I felt the need to keep my cards a little closer to my chest. This is a lot more heart-on-sleeve, but in a way I feel comfortable with. He also spoke about how the project would impact his work with The Cribs and said that the band would "always exist in one form or another". "I wouldn't say it's over for The Cribs, but we just haven't made any plans," he said. "When I'm with my brothers this takes a back seat, and when I'm out here The Cribs takes a back seat. That's just the way it's going to be." Exclamation Pony will play their first ever UK gig as part of the NME Awards Shows, with the pair set to perform at London venue Hoxton Square Bar & Kitchen on February 19. The 2013 NME Awards Shows have been taking place in London throughout February and have featured headline gigs so far from Toy, Tribes, Gabriel Bruce, Hurts and Everything Everything. Scheduled gigs set to take place later this month includes shows from Savages, Tim Burgess, Fidlar and Jagwar Ma.